And finally, I have watched one of the best films of 2009. 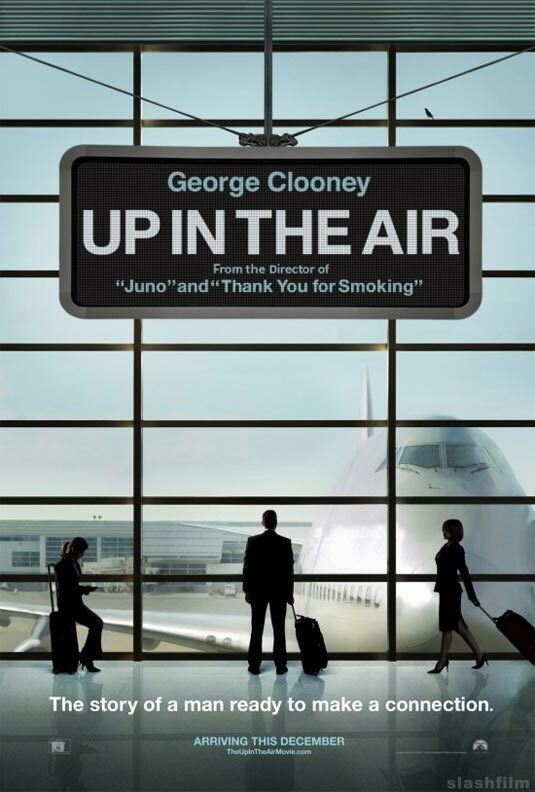 An urban film, much corporate and passive, Up in the Air lives up to its expectations. The film is based on the novel by Walter Kim and it is the screenplay that makes magic in progress. The film stars George Clooney who plays yet another charming performance. Vera Farmiga’s role of a frequent flyer packs a punch, especially in those conversations where they reveal their mischief aboard the aircraft. Gone are the days where the lead pair met and bonded in an orchid or a lake. Here we are, meeting in the Frequent Flyers Club. So, Ryan Bingham is a corporate downsizer who spends his time in the airport and on airplanes, flying to different cities and firing people. Isn’t that too ironic! His boss, Craig Gregory finds the internet video call idea of his trainee, Natalie Keener to be interesting as it would put his men “off the road” and he can save a lot of greens. But, Ryan disapproves the idea and also lets Craig to witness Natalie’s lacklustre efforts. Hence, Craig sends Natalie along with Ryan to learn first-hand. Amidst this clutter is the frequent appearance of Alex Goran, the woman with whom Ryan plays it casual. The characterization of the two women can be compared to Yin and Yang. Natalie is young and inexperienced, Alex is aging and highly experienced. Natalie likes to make arguments loud, Alex plays it silent. So, how does Ryan juggle between Yin and Yang? Watch Up in the Air. The film has got me into its creative holds. The slick editing, the stylish camera angles, the sensuous sounds, all of them are a big plus. If The International was a recession-era thriller and Public Enemies, a Great Depression-era story, Up in the Air proves to be a light-hearted recession-era drama. Indie actress, Anna Kendrick makes her much wanted breakthrough as the young downsizer. Craig Gregory, the boss is quintessentially portrayed by Jason Bateman who with his charming looks makes the role look easy. But, Clooney offers the real punch with his surprisingly tireless appearance and monotonous voice. After Thank You For Smoking and Juno, Jason Reitman has directed another marvel. Up in the Air is a delight to watch. Those 110 minutes would be worth your money and you’d want to watch it again. The film is routed win the Oscar for Adapted Screenplay. So, Jason and Cynthia have an eight-year relationship where they haven’t conceived so far. Now, they are on the verge of divorce when they decide to go to a Holiday resort in the islands of Bora Bora which offers couple retreat therapies. But, it is expensive for ONE couple and so, they book a package for FOUR couples. They convince their friends, Dave and Ronnie, Joey and Lucy and the recently divorced Shane who is now with a 20-year old girlfriend to join them so that, they can spend less. Well, my first question is, if you’re not interested, why do you go? My second question, what kind of a nut organized that place? The so-called Eden Resort is more like a tough and demeaning hostel. The couples are forced to attend therapy sessions. And since day one, the four find differences. The females dump the males for the hyper-humane yoga trainer while the men decide to hop around with masseurs and other bikini girls. Returning to the screen is American A-class family’s favorite comedy star (no, not Jim Carrey), Vince Vaughn who along with Jon Favreau writes the screenplay which is quite a sitcom formulaic episode. Another thing to notice is the fresh-face female cast – Malin Akerman, Kristen Davis and Kristen Bell. Akerman tries to cope up with Vaughn’s comic timings but puts up a good show. Kristen Davis as the old and tired wife to Favreau does trail behind a lot while Kristen Bell sticks to the script and plays her role well. Jean Reno plays Monsieur Marcel, the founder of Eden Resort. Well, Reno isn’t used to comedy movies unlike Pink Panther. But, this is a little weird for the French who tries his best to poison and kill English words with his foreign accent. Despite the stumbles in their relationship, the four couples finally make it right in the end. Hey, doesn’t this happen in every other ‘couples’ film? Well I have to nod my head to this. 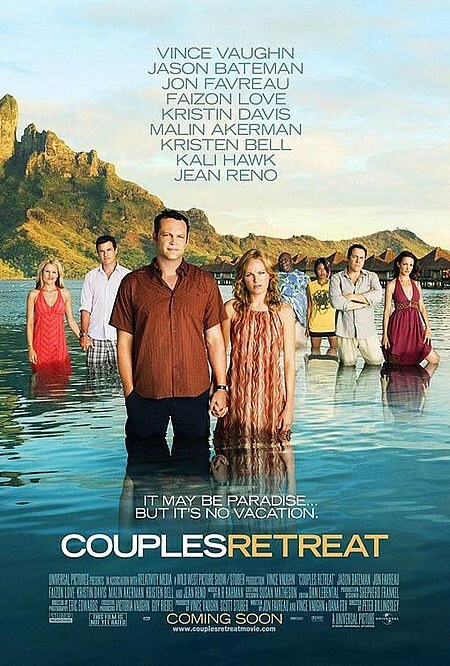 But, every film has a feel embedded in the core of the script which I have found missing in Couples Retreat.But, timely humor saves the day for this big-budget nothing. The film is at all for the Vaughn fans. But, beware of those junky one-liners! And, kids can be really messy. The film is packed with more comedy, less romance and a little sitcom drama in the end. But, this surely isn’t failing to entertain if that’s what you want. But, keep an eye on the inflating price of the movie ticket.